We recently fulfilled a lifetimes dream and went storm chasing in the US. We covered 4,500 miles, visited 4 states (Texas, Oklahoma, Colorado and Kansas) and saw pretty much everything we wanted to thanks to the amazing skills and diligence of all the guys at Silver Lining Tours. Roger Hill is the World Record Holder of number of Tornadoes seen by any human being and he sure knows his away around meteorological data. We went for the thrill of chasing, the chance of seeing some supercell ‘mothership’ structure and maybe a tornado or two. We saw 9 tornadoes in total including this monster just outside of Canadian in the panhandle of Texas. I now realise that the sheer awe of these storms is almost impossible to capture on a camera as the experience is so much more than just visual. The sheer scale, sound, colour, feel and destructiveness of these beasts cannot be described nor represented visually properly unless experienced. 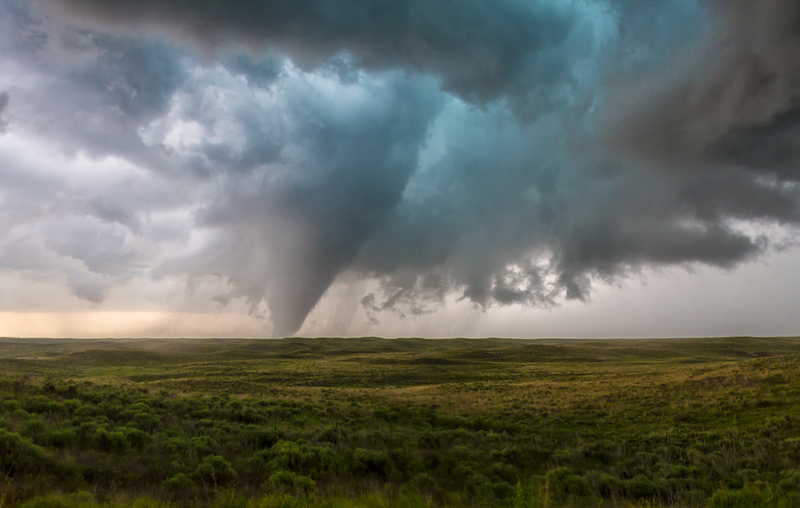 This is the first of many images I hope to post regarding this trip and shows the large cone tornado not long after it formed. We were brought down to earth shortly afterwards when we were reminded of the power and terrible damage these things can do when we heard that 3 people were seriously injured by this tornado as it ripped through an oil drilling site. After around 10 minutes it roped out and we realised the ‘meso’ had re-formed pretty much over our heads, we beat a hasty retreat and watched from a much safer distance! We chased this storm for around 3-4 hours and it hardly moved at all being anchored between a front and a dry line. It dropped over 4″ of rain, tennis ball sized hail and flash flooding before it finally dissipated. When they mature these things are like living beings, dangerous, often fast moving and unpredictable. Thank goodness we were with a veteran of over 30 years storm chasing! Anyway, hopefully this gives just a small indication of these storm’s awesome nature. The experience is addictive and we have already vowed we will return soon to gain more experience of these incredible natural phenomena.